“I wonder” is Rajesh Ram’s fifth solo, after a gap of nine years. 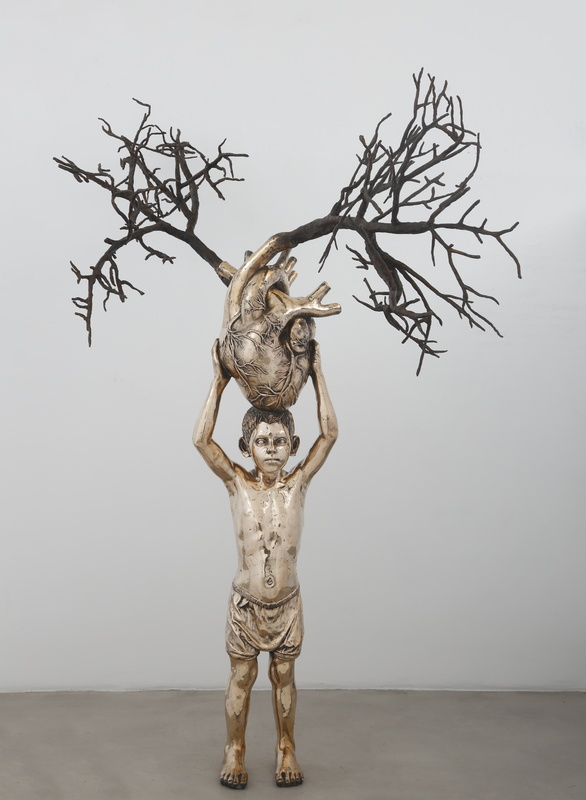 Comprising Ram’s most recent body of watercolour drawings and life-size bronze sculptures, the exhibition resumes the artist’s interest in storytelling, capsuled in idioms and proverbs that tell of a time of childhood innocence and curiosity. Informed by the tales of the Panchatantra and the Jatakas, Ram’s work is a visual retelling of children’s fables and animal stories, resplendent with mysterious details that place the painter’s own experiences and memories at the heart of each story. 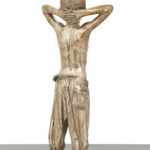 Narrated in first person, the exhibition is an autobiographical account of Ram’s reminiscences as a young boy growing up in a small village, retold as an adult living in a bustling metropolis. Storytelling is one of the earliest tools used to teach morals and help bring order to a wildly diverse set of personalities within a community. In India, storytelling first began as an oral tradition and was written down as fables and mythological tales dating to the 2nd and 3rd centuries BC. With humans characterized as their animal equivalent, the tales serve a two-fold purpose: they situate human behavior in the animal world, and they seed values amongst a collective. Additionally, they reflect the nuanced truths of human thought and behavior. Storytelling relies on memory and the experiences of the storyteller. In his 1936 essay on Nikolai Leskov—The Storyteller, Walter Benjamin speaks of the impending destruction of collective memory resulting from the transition from community to society. The storyteller takes what he tells from experience, his own or others, and makes it the experience of those hearing the tale. Benjamin also describes the significance of touch, of practical experiences being shaped by the hand- a point he cared to describe in great detail, thereby firmly aligning storytelling with craft. Encouraged to enroll at the Delhi College of Art by friends who recognized his skill in sculpting religious icons, Rajesh Ram formally trained to be a sculptor in 2006. His imagery drew from his childhood years of growing up in a rural village in Jharkhand, where he recalls his grandmother repeatedly narrating what seemed like an unending repertoire of anecdotes and idioms. Most stories contained a moral packaged in proverbs and rhymes that made them easy to remember as they rolled smoothly off the tongue. These have remained an influence on Ram’s work through his artistic career. Although his characters appear in the figurative manner of illustrated storybooks, the context in which they are located references the complexities of social relationships and the speed of urbanization rather than the simplicity of life within which they were conceived. The drawings therefore, evolve beyond the literary formats of illustrations and graphic novels, urging the viewer to associate his own story to the visual. Animal characters are a defining feature of the fable, one of the oldest and most popular narrative genres. Personified animals appeal to the child’s imagination, feeding their curiosities and accommodating fantasy alongside comedy. Because of their association with purity and sincerity, children’s narrations make stories more poignant and inspiring. 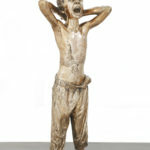 Ram’s depictions of a young boy screaming out a message in the work Messenger, 2017 or the boy standing with his hands in the air in Hands Up, 2017, are drawn from village life, and are particular to the time of one’s childhood. 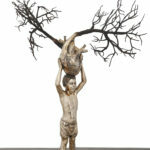 The choice of material in glossy (and expensive) bronze and the manner of rendition underlines at once, the loss of innocence as well as the need to refocus on the natural and the unpretentious. In Ram’s watercolours, we recognize the powerful and egotistical tiger in Demolisher, 2017 and the boy on the foolish ostrich that denies his problems by burying his head in the sand in Hiding Yourself, 2017. In the former, the man-tiger has let greed guide him into destroying his own habitat, while the boy on the ostrich exemplifies us as an immature, and ignorant people. Ram’s art successfully relocates fables in today’s world, articulating the loss of collective memory and oral traditions in the age of information and technology. Stories live in proverbs even when the story itself is lost. And in doing so, they serve as a codified archive of memories. Repetition and the manner of a story’s re-telling are important to its survival. Reflecting the human ability to store and communicate ideas in a non-literal manner, stories animate human life, defining their purpose. Ram’s work has over the years taken a darker turn, perhaps in response to the times we live in. The humour and the colour now appear to shield a sinister reality where rivers run dry and forests are razed to make way for brick dwellings. The clock ticks as we see our built world crumble (Time Terror, 2017), an unfortunate consequence of our own doing. The artist raises an alarm. 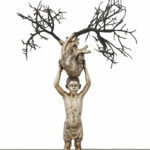 A sculpted boy holds his heart on his head in submission or more likely, in hope (Heart on tree, 2017). And a stubborn zebra appears to be kicking up some rubble in Blind Faith, 2017, a work that suggests our own arrogance and placidity, and our refusal to acknowledge the impending ecological disaster we face.